Biennial or perennial herb 40 cm - 1.5 m tall Stem: usually erect, woody at base, and typically with mixture of star-shaped and unbranched soft hairs. Leaves: alternate, stalked, toothed, short-hairy, circular or kidney-shaped in outline with three to seven shallow, broadly rounded lobes. 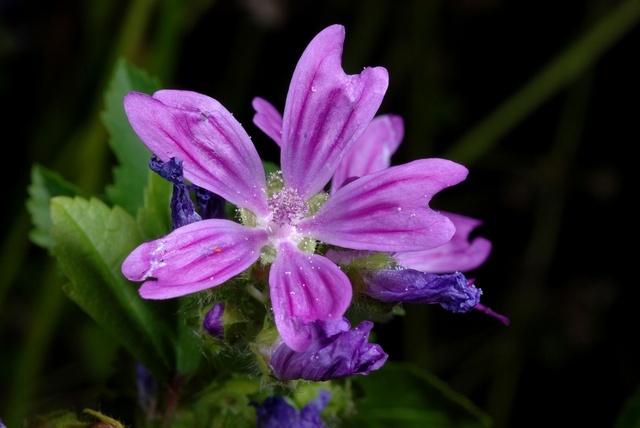 Flowers: many, clustered in upper leaf axils, long-stalked (stalks to 5 cm), showy, rose-purple, 3 - 6 cm diameter, radially symmetric, with five spreading petals, and sepals immediately subtended by three, hairy, oblong to egg-shaped bractlets. Sepals: five, but fused at base, then separating into five widely triangular to egg-shaped lobes with fairly abrupt pointed tips. The calyx as a whole is covered with branching, star-shaped hairs. Petals: five, pink to purple with darker veins, hairy, 1.2 - 3 cm long, triangular with narrow base and the broad outer edge often very shallowly indented or notched. Stamens: numerous, but filaments fused into an elongate tube with the anthers protruding near the top. Pistil: enclosed by the stamen tube, with at least ten superior carpels (ovule-bearing structures), ten or more slender styles coming up through center of stamen tube, and ending with exserted, slender stigmas facing inward. Fruit: a ring of ten or more, one-seeded, hard, dark, usually at least slightly hairy, strongly veined, wrinkled, deeply pitted, 2.5 - 3 mm tall, somewhat half-circular to more oval (inner side flattened), beakless, wedge-like segments (mericarps) subtended by the persistent sepals atop a long stalk. The ring of fruit segments looks similar to a peeled tangerine or clementine fruit where the slices or wedges would be analogous to the mericarps. Mericarps typically separate from each other for dispersal, but do not open to release the seed (indehiscent). Similar species: Malva sylvestris may be mistaken with our other species with rounded shallowly lobed leaves such as M. verticillata, M. rotundifolia, M. parviflora or M. neglecta, but all of those species have very narrow subsepal bractlets, their flowers are usually a bit smaller (petals under 2 cm long), and the last species does not have pitted mericarps. While the wrinkled and pitted mericarps of M. rotundifolia and M. parviflora can be slightly confusing, they are much shorter than those of M. sylvestris (typically not over 2 mm), and the persistent calyx is more upright and surrounds the ring of mericarps. Although the wide and somewhat egg-shaped subsepal bractlets of M. alcea may resemble those of M. sylvestris, the leaves differ greatly since those of M. alcea are deeply and narrowly lobed. Habitat and ecology: A native of Eurasia, occasionally escaping from cultivation. Etymology: Malva means Mallow. Sylvestris means "of the woods", or "growing wild". A rare garden escape. It is said that this variety is the form of the species that has escaped in the eastern United States and probably all of our reports should be referred to it. All specimens seen belong to the variety. Erect biennial, 4-10 dm, hirtellous to glabrate; lvs orbicular or reniform in outline, shallowly 3-7-lobed, the lobes broadly rounded, serrate; petioles hairy only or chiefly in a single line on the upper side; bractlets oblong to ovate or obovate; fls fascicled in the upper axils, on pedicels to 5 cm; pet red-purple, 2-2.5 cm; mature carpels rugose-reticulate on the back, glabrous or sparsely hairy; 2n=42. Native of Eurasia, escaped from cult. here and there in our range. June-Aug.